In the frontal offset test, dummy readings of neck tensions indicated marginal protection for both the 6 and the 10 year dummy. In the 10 year dummy, chest deceleration also indicated weak protection of this part of the chest. In the side barrier test, the head of the 10 year dummy (on the impacted side) 'bottomed out' the curtain airbag and a hard contact was recorded. This hard contact and the head injury values it generated indicated poor head protection. 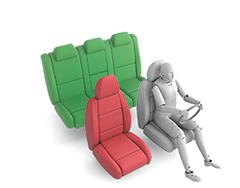 The front passenger airbag can be disabled to allow a rearward-facing child restraint to be used in that seating position. Clear information is provided to the driver regarding the status of the airbag and the system was rewarded. 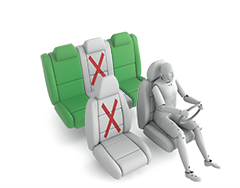 Nevertheless, universal restraints failed the installation test on the front passenger seat owing to the position of the buckle. 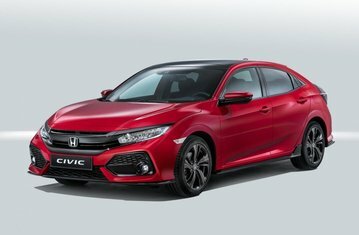 Otherwise, all restraint types for which the Civic is designed could be installed and accommodated in the car.